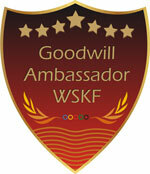 The World Sports Karate Federation-WSKF is the mega organization who is appointing Goodwill Ambassador (GA) in each country of the world and the GA would further choose upto 10 to 20 personalities as Goodwill Ambassadors (GAs) from the following areas (a). Extra Ordinary achievement in the Education fields-men or women? (b.) A top businessman/Industrialist-men or women? (c.) A top political personality-men or women? (d.) A top NGO head-men or women? (e.) A top Sports Person-men or women? The eligible candidate can Apply for "Goodwill Ambassador" which would be appointed over 242 GAs in each country of the World.